﻿ AutoPIPE - Applicad Public Company Limited. Bentley AutoPIPE V8i is the most productive design and analysis program for calculating piping code stresses, loads, and deflections under static and dynamic load conditions, even to the highest nuclear standards. Costly plant shutdowns caused by pipes moving as they heat up can be avoided with 3D ‘hot’ clash detection. This functionality can also be used to avoid piping failures during extreme loading conditions (like earthquakes). 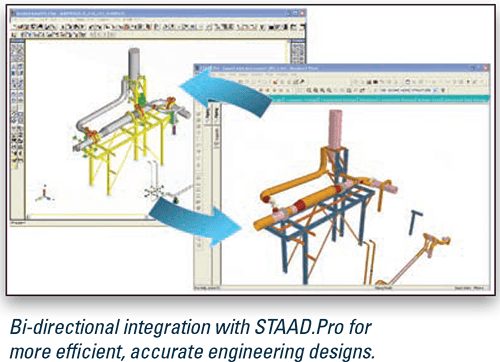 AutoPIPE also includes special features for advanced buried pipeline analysis, wave loading, fluid transients, FRP/GRP or plastic pipe, as well as time saving integrations with STAAD.Pro and all major plant design systems. The OpenGL CAD graphical user interface found in Bentley AutoPIPE V8i enables users to easily create and modify the pipe stress model. 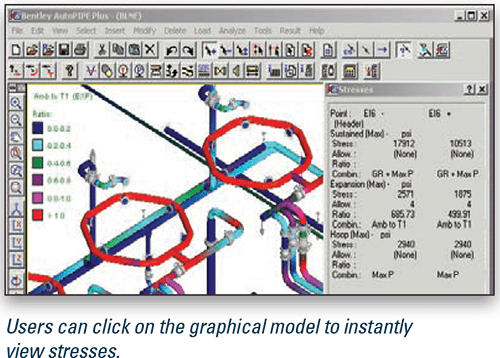 Users can simply point and click on the graphical model to insert, modify, or delete pipe supports, loads, or components. After each operation, the model display is automatically updated for instant visual feedback. Using AutoPIPE V8i graphical select options, users can insert, delete, or modify components, supports, pipe properties, temperatures/pressures, or other parameters across an entire range of points with one command. Graphical selection of ranges is also used to cut, copy, and paste operations. Users can check, sort, or make changes to the input data quickly using interactive grid spreadsheets like Excel. AutoPIPE V8i features up to 99 undo or redo steps to correct mistakes, perform ‘What-if’ analysis, or to iterate quickly through design scenarios. valve utilities, advanced load sequencing, non-linear support gaps and friction and jacketed piping. Local stress calculation to WRC 107, WRC 297, PD 5500, KHK, API 650 is available using AutoPIPE Nozzle. Once a system is analyzed, users can click on the graphical model and instantly view stresses, deflections, forces, and moments. Color-coded results and pop-up windows enable users to quickly identify and investigate critical areas without having to review a voluminous amount of batch output data. Up to 1000 load combinations can be viewed with the powerful on-screen results grid, which provides interactive filtering, sorting, and printing of maximum result values. The only solution on the market today for a truly integrated design between piping and structural analysis, AutoPIPE V8i can automatically transfer pipe support loads as well as import complete structures to and from STAAD.Pro V8i, saving weeks of design time and providing safer, more-realistic engineered designs. Import 3D plant design CAD models from AutoPLANT® V8i, PlantSpace® V8i, OpenPlant® V8i, Intergraph PDS®, SmartPlant®, CADWORX®, SolidWorks®, Inventor®, Plant 3D, CATIA®, and Aveva PDMS®, into AutoPIPE® V8i to save hundreds of man hours and ensure accurate pipe stress models. AutoPIPE V8i rigorous quality assurance program has passed numerous nuclear and Nuclear Procurement Issues Committee (NUPIC) audits to 10CFR50 App. B, ISO9001, CSA N286.7-99, ASME NQA-1, and ANSI N45.2 standards, making Bentley AutoPIPE V8i one of the few pipe stress programs with a high-level of quality. AutoPIPE Nuclear V8i provides design of critical safety pipework to ASME Class 1, 2, or 3. 100 thermal, 10 seismic, 10 wind, and 50 dynamic load cases.